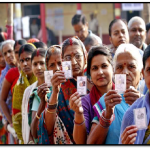 The 9th National Voters Day was celebrated on January 25. 25th Jan is also the day when the country’s Election Commission was founded in 1950. The first National Voters Day was celebrated in 2011 under the then Chief Election Commissioner (CEC) S Y Quraishi. It was Quraishi who had asked the government to set aside a day to the voters of the country. The National Voters Day is celebrated to encourage more and more young people to participate in the country’s election process and increase voter enrolment. The Day is organised to spread awareness among the voters and promote informed participation during the elections. This year, the theme of the National Voters Day was ‘No voter to be left behind’. Voting is a basic process that helps to form a country’s government. One can choose their representatives through voting. Voting rights enables people with the right to question the government about issues and clarifications. It also provides a sense of freedom to express opinion in major decision making for the benefit of the country in a democratic nation. The day was celebrated at over six lakh locations covering approximately ten lakh polling stations across the country. During the National Voters Day, first time voters were invited and asked to collect their Electoral Photo Identity Cards (EPIC). The chief guest of the National Voters Day function was President Ram Nath Kovind. The function is organised by the Election Commission in New Delhi. Chief Election Commissioners and senior officials from Bangladesh, Bhutan, Kazakhstan, Maldives, Russia and Sri Lanka were also be present at the occasion. The Constitution (Sixty-First Amendment) Act, 1988 had lowered the threshold voting age from 21 years to 18 years. It was observed that the youth who had recently attained the voting age of 18 were showing less or no interest in getting enrolled in the electoral rolls. The enrolment level was as low as 20 per cent. Who are the Rohingyas and what is the Rohingya crisis? What Is A Poverty Line?